... successful disco groups of all time. ... out the Barbican last year. 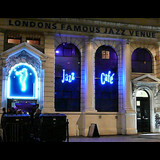 as you ease yourself back into reality with a chilled Sunday evening at the Jazz Cafe. ... Sunday 5 th May Welcome to Sunday Soul; the perfect end to your week. back at the Jazz Cafe. Mndsgn collaborator Devin Morrison also joins the bill. to the Jazz Cafe for a double show this spring. show to the Jazz Cafe for a double show this spring.